I had a combination skin, but somehow it's more dominant to dry skin side. Especially after taking bath. Hence, the reason I prefer moisturiser rather than a cream. But, I have always like masks as I can feel that my face being pampered. So here's my review on this product. Usually whenever we applied a face mask for 15-20 mins, it will leave you sticky, and somehow I could not help it, but go to wash room, to wash my face. 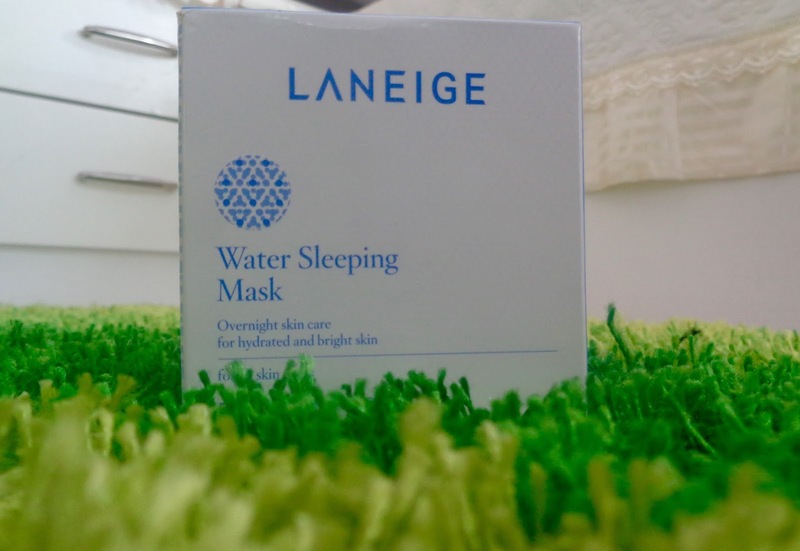 But, as the name goes.. it's seriously a water sleeping mask. 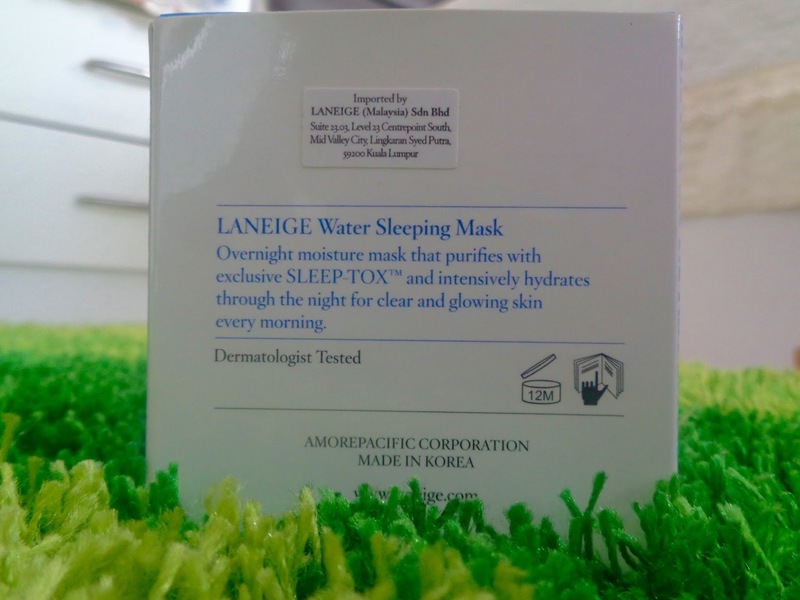 A mask for you to sleep, and to stay hydrated and glowy the next day. This is a Korean Product. As mentioned in the packaging, this mask is suitable for all skin types. If you have an oily skin, worry no more, because, this texture is gel-water-like and it also helps you to prevent wrinkles! So, this product claimed to restore your skin and its moisturise while you sleep, and your skin will look like a well-rested, moisturised and lively look, like you had 8-hours sleep, even if you didn't. The advertisement did say this. In terms of the texture, it has a light weight texture, and leave you like you did not even applying anything onto your face. Fast drying effect, once you applied. Another thing is, this product has its own fragrance. To which I know, some face does has an adverse reaction on fragrant and cause a breakout. But, according to Laneige, this scent helps you to sleep, thus, "sleepscent"is there. So far, my skin is still doing good and adaptive to this scent. It comes with spatula, hence it ensures your hygiene. But, someow, I am being a slacker, in which I just used my finger. By the way, this is the 70ml packaging, and one packaging lasts for 2-3 months, depending on the usage. As for me, I will used this twice a week, and one to two scoops of spatula will help to cover my face. So far, what I can conclude is, this product is not sticky as other gel type masks and it's really good at keeping my skin hydrated and glowy the next day. I am seriously in love with this product! Oh, if you have acne, I think, it does not help in alleviating the problem yet does not even worsen the condition as well. But, this is only my review, after all, our face and skin will react differently to product. From what I read somewhere on the clouds, if you fly often, this is also nice as in-flight treat (during night) as it helps your skin protected from drying airplane air. But, so far, I never try it. I also once tried to apply this product on the day, and it does not bring any harm. You can always put your BB cream afterwards, but it does not recommended though, because, firstly, it's for the night usage. Secondly, it does not protected with SPA. Just follow the recommendation okay!. In terms of the price, its a bit pricey if you purchase it on the outlet itself compared to online. If you purchase it online, you can get a price as low as RM120 per box (70ml). The outlet sell RM145 (Sogo branch) per box. Currently Go Shop doing some offer on this product. It's worth it and affordable! Click HERE to see the promotion. It has its offer set which comes with multi cleanser, firming sleep mask and Water sleeping mask for only RM239!!! (Postage is excluded), go grab it NOW! !.